When I had Mr K and Ms C, on both occasions my mother flew over from Singapore to give me a helping hand for 6 weeks. Normally, your mother or any experienced female elder (maybe your mother-in-law) will offer to help. In Singapore, if you have no one to help, you can employ a confinement lady for a month. This confinement lady is usually well trained and they will cook and look after you. Confinement starts from the moment you are coming from the hospital. In some cases, straight away after birth. 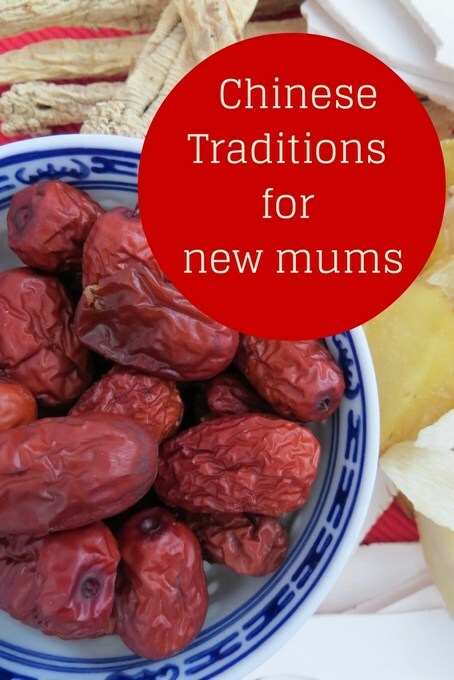 Not all new Chinese mums will follow the restrictions – it all depends on yourself. I know if I didn’t follow the customs, my mother would have nagged and scolded me until I listened. Luckily, I had Mr K in winter time which I will explain in a minute. No washing hair for a whole month. Yes, I am not joking! You won’t want to stand nor sleep next to me! I didn’t wash for the whole month and when I comb my hair, my orange comb was covered in stains! Luckily, it was during winter time, so I hardly sweat. Can you imagine doing this in a hot country! No seafood such as prawn, crab etc. They are considered toxic/harmful food to your body especially when you have C section. No ‘cooling’ fruits such as pineapple, cucumber etc. No ‘windy’ food such as onion etc. No air con nor fan! If you are in a hot country, can you imagine how hot you will be! When I had Ms C, it was so hot and I had to draw my curtain and stay in the darkened room to cool myself. The elderly believed avoiding these will help you avoid health problems such as rheumatism and headaches when you get old. Cover yourself from head to toes. Yes, you need to wear long trousers, sock etc. Bathe or clean your body with water infused with herbs. There are a huge list of confinement food. From what I know, this consists of these few simple ingredients: ginger, sesame oil and black vinegar as they help to get rid of wind in the body. My mother had cooked me a variety of foods such as lean pork meat with ginger and sesame oil, sesame oil chicken, fish soup, spinach soup and other normal and healthy meals. My mother-in-law cooked me ginger and black vinegar pig trotters which I had to return back to her. I just couldn’t stomach it! They say it’s good to get rid of all the toxins in your body. But the thought of seeing the trotters really put me off! Also I don’t eat pork liver, kidneys or pig stomach. These are iron rich and great for replacing blood loss! I am at a loss for words to describe how I felt during my confinement. I felt dirty because I was not allowed to shower and wash my hair and also not allowed to leave home. Yes, for the whole month, I am at home with my children. My husband had to do all the shopping and errands including registering their names and GP. I am so glad to have done my duties of having two children and hopefully I won’t need to go through this again!